A high end home in the Back Bay, Boston MA needed to reduce the noise that was coming from the shared stairway wall of the condo. The sound was coming into the stairwell from the condo next door. 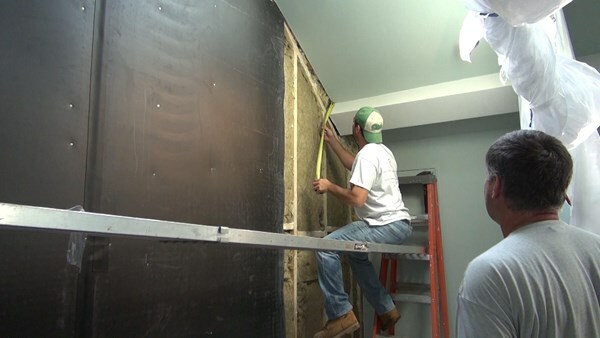 New England Soundproofing had to get into the existing wall, strip off the existing drywall, remove rigid foam insulation, and install softer sound-absorbing insulation, plus a layer of Sound Barrier HD, before putting drywall back up in the stairwell. 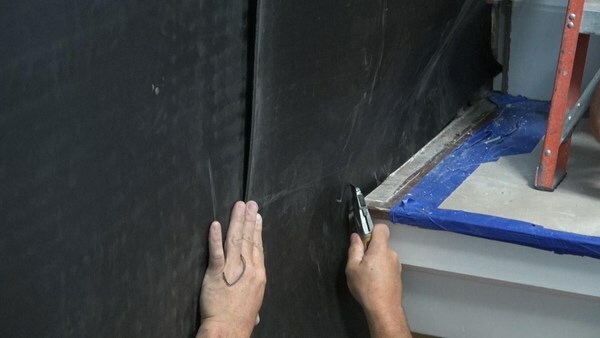 If there were no stairs, New England Soundproofing could go a step further, attaching sound clips and metal channel to isolate the interior wallboard from the studs behind. But that would add thickness to the wall and there's no room to do that in this situation without demolishing and rebuilding the stairs — which, understandably, is not in the budget. 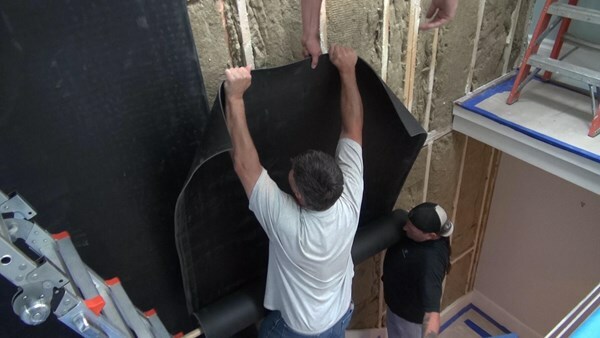 After a perfect sealed up wall, the noise was greatly reduced and the homeowner was pleased. For more pictures or information on the project, visit the JLC (Journal Of Light Construction) website HERE and see more information and pictures. JLC is one of the largest construction magazines. 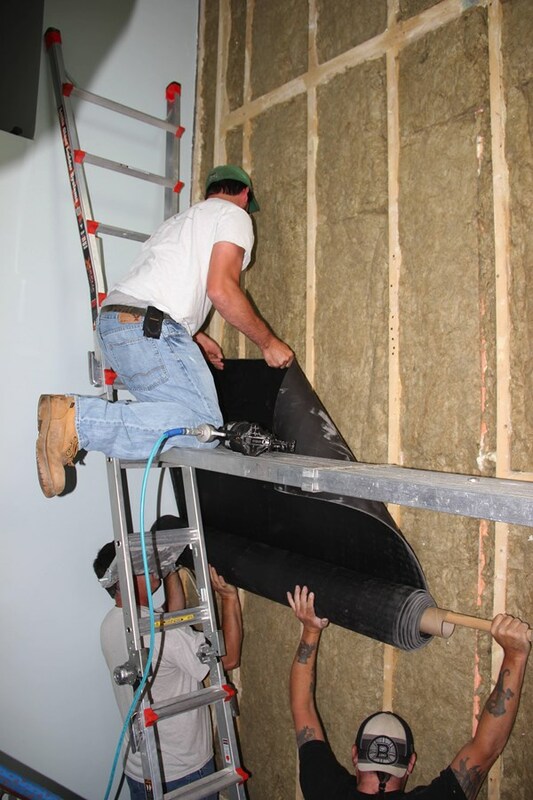 They came in for the whole project, learning about soundproofing and the issue of noise within New England. Journal Of Light Construction is a 32 year old magazine that provides residential and light commercial contractors with practical jobsite advice on what works, what doesn't, and why. 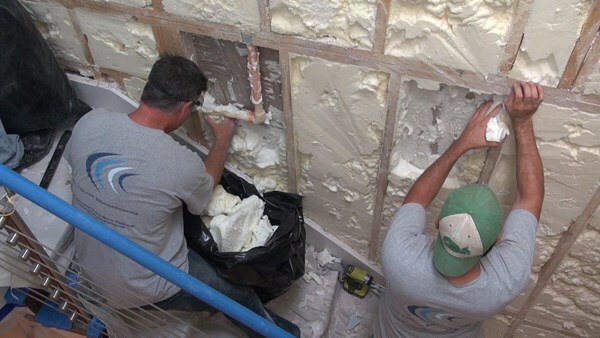 Taking out the existing insulation.